Solgar's Gold Specifics are a premium range of natural combination formulas that get right to the point by aiding and supporting specific functions in the body. They're the cutting edge of nutritional science. To create Gold Specifics our researchers utilised the latest studies and the most advanced nutritional technology. Never before have we had such a wealth of research about natural constituents and how they work in the body. Never before have we had such clear understandings of their significant, and highly specific, physiological benefits. As a result Gold Specifics are revolutionary formulas, synergistic blends of vitamins, chelated minerals, free form amino acids, advanced phytonutrients, powerful antioxidants and powerful standardised herbs. All incorporate the most innovative ingredients available today. All offer precise nutrient levels to ensure optimal results and proper nutrient forms for efficient absorption and utilisation. 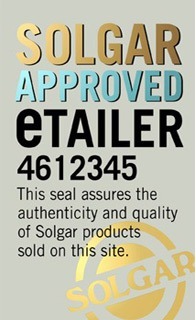 Solgar supplies several different Gold Specifics supplement products such as Solgar Antioxidant Free Radical Modulators 60 Vegicaps Capsules, Solgar Bone Support 60 Tablets and Solgar All in One 100 Tablets. You have no Solgar vitamins products in your shopping cart.